JOIN THE AFTER SALE NOW! Join us THIS Saturday for an awesome live sale! 800+ corals will be heavily discounted up to 60% OFF! Some will even be $1 or $5! Make sure you're ready when the corals drop, they're gonna go quick! We will be releasing batches of 3-5 corals every 5 minutes. The best way to do this is by creating an account on the site now! There are no restrictions on $1/$5 corals. If you win it, it's yours! Make sure to check out FIRST! Shipping will be a DISCOUNTED 19.99 for Florida residents or 29.99 for out of state. This is the lowest shipping we've offered all year! There will be no free shipping BUT if you have a pending order that is already receiving free shipping you can combine your orders together. All sales are final. No refunds on livestock. No credits, gift cards, coupons or additional discounts can be used during this live sale. Local pick up begins Tuesday March 26th. If you email us the day and time you want to pick up your order we can have it pre bagged for you. The Top Shelf Aquatics Freedom Live Sale takes place on this Saturday, July 7th! New coral will be posted every 10-15 minutes starting at 12pm Noon (EST) and will continue for 12 hours all the way until Midnight (EST)! All the coral offered during the sale will be WYSIWYG and linked directly to our website for purchase. -Open your account on TopShelfAquatics.com now (click on "My Account" in the upper right hand corner of the homepage). This reduces your checkout time and prevents others from purchasing your coral while you are signing up. -It is better to make multiple smaller purchases during the sale to limit the time items are held within your cart. An item is not yours until you have completed checkout. Holding it in your cart does not reserve the piece! -Shipping will be added to your first order based on your shipping zip code. On your second, third, fourth, etc. order, make sure you select “Add to an existing shipment”during checkout to avoid paying for shipping multiple times. We will be raffling off a $500 Reef Gear Credit on the day after our Live Sale, July 8th. This credit will be good for any sort of dry goods that you may need for your tank! New pump? New heater? Fish food? Coral Supplements? WE'VE GOT YOU COVERED! In order to qualify and receive your first raffle entry, you must make at least 1 purchase during the live sale. Before and during the sale, you can earn additional entries into the raffle by completing any or all of the tasks below! GOOD LUCK! **Please send us a PM with the Title: "RAFFLE ENTRIES: (your name here)" once you have completed any of the items above. Please include a screenshot of #1 and #2 and the post number (upper right hand corner of your post) for #3 so that we can verify all of them. Make sure you're paying attention! We may release clues later in the week! Due to the nature of live sales and the amount of attention they require, we may be slow in responding to your questions. Private Messages (Conversations) here on R2R will be the only method of communication that we will be using during the sale. If you need to contact us, please send us a PM here on R2R and include your full name, email, and post number (if applicable) to ensure that your question is taken care in a correct and prompt manner. If we feel that a particular question is one where an answer/explanation would benefit everyone in the sale, we may post both the question and the response directly in the thread for all to see! Available starting Wednesday, July 11th. Please confirm your order is ready for pickup prior to coming into the store. With dozens of orders, we want to ensure you receive the proper pieces. -Free shipping will be unavailable due to the already lowered prices. -Discounted Flat-rate shipping of $29.99 (Cont. 48) and $14.99 (FL Residents) will be offered for the live sale. -All live items are shipped by FedEx through Priority Overnight Service. -Orders are shipped Monday-Thursday and are scheduled to arrive by 10:30am local time the following day. Remote shipping areas may be delivered later in the day. -All Livestock is inspected and placed into clear plastic bags. Each bag labeled with their common name. -Each piece is double bagged to reduce the possibility of leaks during the shipping process. -Insulated Styrofoam boxes are used on all orders. -Packing peanuts accompany the livestock for shipment stability. -Top Shelf Aquatics staff will determine the use of heat or ice packs based on the weather at the time of shipment. -In the unlikely event of a DOA (Dead on Arrival), you must send a very clear digital photo within 2 hours of delivery (Fed-Ex posted time). -Top Shelf Aquatics cannot be held responsible for mechanical issues or weather delays that may cause your Fedex shipment to arrive late. JF MADNESS IN MARCH LIVE SALE OFFICIAL THREAD! MOST AWAITED LIVE SALE IS HERE!!! Winter Live Sale!! 800+ Corals bringing the HEAT! Wow! Where has the time gone?! Our 8 year anniversary is quickly approaching and we would love for YOU to celebrate with us! BE HERE at 4pm EST on Saturday November 10th! We had such a great time with you all in April and October, this Live Sale will be one to remember! All kinds of festivities in the Holidays Season. Lots and losts of $5 frags stock stuffers, prizes, and incredible deals! Frags, colonies, signature corals, limited releases, and more! Deep discounts and rare offerings. If you have participated in any of our past live sales, we thank you! And you know UC will not disappoint! You MUST first purchase a shipping module HERE. Then shop as much as you like and we'll combine shipping for you. No more than three $5 corals per person. For every $5 coral you must purchase another coral as well. You must complete checkout to secure the coral. If a cart item got snatched away, do not dismay and be patient! We will have great selections throughout the 2 days so you'll be sure to get something you love! Checkout as many times as you like, your shipping will be combined automatically. All orders are final, no refunds, exchanges, credits, promotional gift cards, coupons, or extra discounts will be applied in the sale.Our Guarantee covers all the corals we ship. If you have a question please ask through thread posts or PM, as our admin office will be closed on Saturday. If you call the office or send a message through the UniqueCorals.com site, you will not get an answer until Monday morning. If you ask for a customization or substitution, we will try to accommodate you but please understand this may delay your ship date. shipping information so you will have a fast checkout experience. If you are already a registered UniqueCorals customer, great, you are all set to go. There is NO FREE SHIPPING unless combined with another order from our website over $150 in Livestock. Please include your full name and order details in any PM or communications so we may properly identify who you are. That's a total of 7 exciting prizes for you! The chances are really good. Raffles winners will be announced Monday. There are 2 ways to enter the drawings. Make a purchase during the sale, or make one post in this thread every hour during the sale hours (11am to 7pm PST). If you do both you get 2 entries. Each person can only win one prize. Drawing results will be posted one day after the Sale. Our admin office opens on Monday and will get to your requests ASAP. Thanks for understanding. If you see something else you like in the non-LiveSale store, just choose the "Add-on Order" free shipping option upon checkout, and we'll combine shipping with your Live Sale order (provided you have purchased a shipping module, offer only good for livestock orders). CHRISTMAS LIVE SALE - Santa is coming early this year!!!! Join us on Reef2Reef Saturday July 21st for our YR 14 Year Anniversary Live Sale from 10am-4pm pacific time/ 1pm-7pm eastern time. 700+ WYSIWYG frags, $5 & $10 corals & awesome raffle prices! Every hour we will be offering discount $5 corals. These discounted corals are being offered as a thank you to those who participate in the live sale. Each $5 or less coral purchase will require the purchase of 1 regular sale item priced at $15 & above. Limit 3 per customer. Purchase your Shipping Module before the Live Sale at a Discounted Rate ($25). Available now thru Saturday 7/21 before 9am (pacific time). You select the shipping module with the corresponding shipping/delivery date that works for your schedule. There are a limited number of shipping slots available each day. Please make your selection as soon as possible to ensure your desired shipping date is reserved. Local Pick Up - Will be available starting on Wednesday 7/25 after 1:00pm. Please verify with us the day you wish to pick up your order so can be sure to have everything ready for you. You asked for it, and now it's here! January 27th starting at 11am, it'll be like Christmas morning all over again. We will be posting some corals $5, $10, $15 each throughout the sale! Most coral will be deeply discounted. You'll be amazed at some of the value you will find! Enjoy! No more than four $5 corals per person. For every $5 coral you must purchase another coral as well. We will have mostly WYSIWYG corals and some UniqueCorals.com limited release stock frags, as they become available, we post on the Reef2Reef.com thread (yes, this thread right here) At that time, that coral will be available for purchase, you can click on the link in the post, which will lead you to the page to buy the coral. You must complete checkout to secure the coral. Once purchased the item will be market "out of stock". Checkout as many times as you like, your shipping will be combined. All orders are final, no refunds, exchanges, credits, promotional gift cards, coupons, or extra discounts will be applied in the sale. Our Guarantee covers all the corals we ship. If you have a question please ask through thread posts or PM, as our admin office will be closed on Saturday. If you call the office or send a message through the UniqueCorals.com site, you will not get an answer until Monday morning. If you ask for a customization or substitution, we will try to accommodate you but please understand this will delay your ship date. Over 850+ corals will be posted starting at 11am PST. You can expect a small batch every few minutes. The $5 doorbuster corals will be spaced throughout. With so many choice items, competition is fierce, be ready for some fast clicking! We do suggest you register with UniqueCorals.com first with your shipping information so you will have a fast checkout experience. Please make sure your shipping module is all set before Sunday night, as we will have a large number of orders to fulfill and we want everyone to get their coral in a timely manner. 6 awesome prizes to win! There are 2 ways to enter the drawings. Make a purchase during the sale, or make one post in this thread every hour during the sale hours (11am to 7pm PST). If you do both you get 2 entries. Each person can only win one prize. Drawing results will be posted 5 days after the Sale. Those entering by commenting in the thread please try to engage with your fellow reefers and not just "check in". You will need to PM us after the sale if you believe you qualified so we can verify your posts. Drawing results will be published 5 days after the sale. Good luck, and happy reefing! HOW IT WORKS: Were going to try something different this time, instead of posting for 12 hours and burning up everyone's Saturday we decided to post 500 corals HARD and FAST for the first 3 hours and then were going to take a midday 4 hour break and then resume posting the last 500 corals HARD and FAST again starting at 7pm EST. Each picture will have the pricing and a link that will take you straight to the website listing. You must complete checkout to win the coral, just adding it to your cart will not keep someone else from purchasing it. PLEASE create a customer account on Fraghousecorals.com before the sale so you are locked cocked and ready to ROCK!!! -50 1 Dollar Frags randomly thrown into the mix throughout the sale!!! There will be no limit on how many one person can buy BUT... for every 1 dollar coral you win you MUST BUY ONE AT FULL PRICE. Example: you win five 1 dollar corals you would need to win 5 normal priced (40%OFF) corals. -$100 CASH BACK- EVERY CORAL BOUGHT gets you a ticket into this drawing, example... if you buy 10 corals throughout the sale you will have 10 ENTRIES into this drawing, there will be a total of 1000 entries all based on the sku number of the frag you bought AND TONS Of PRIZES TO WIN!!!! -Jason Fox Home Wrecker Tenuis GIVEAWAY- This drawing is for EVERYONE that PRE BUYS A SHIPPING MODULE BEFORE THE SALE. If you pre buy a shipping module off of our website before 12pm EST Saturday the 2nd it will get you 1 entry into THIS drawing. You must buy at least 1 FULL PRICED (40%OFF) CORAL during the sale for your entry to be valid. The fire will be going all weekend long! 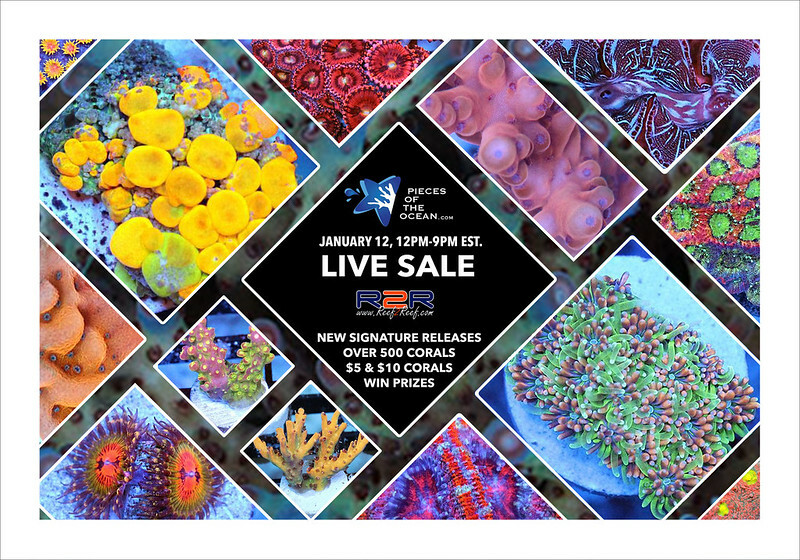 Reef2Reef LiveSale Saturday and Sunday, 9am to 6pm Pacific Time. Lots of $5 doorbusters, prizes, and amazing deals. Frags, colonies, signature corals, limited releases, and more! And as always, all order WILL earn UC Reward points, so make sure you are signed up for UC Rewards. And we combine all shipping automatically for free (provided one shipping module was purchased), so checkout as many times as you like! Starting Oct 13th at 9am Pacific Time, a photo, price, and link will be posted in this thread to corals as they become available. So get your coffees, or beers, or kombuchas ready at 8:55 and stretch those fast clicking trigger fingers. You must complete checkout to secure the coral. If you only have the item in your cart and did not checkout yet, another customer can checkout and procure it. Once purchased the item will be marked "SOLD". Checkout as many times as you like, your shipping will be combined automatically. All orders are final, no refunds, exchanges, credits, promotional gift cards, coupons, or extra discounts will be applied in the sale. Our Guarantee covers all the corals we ship. If you have a question please ask through thread posts or PM, as our admin office will be closed on Saturday. If you call the office or send a message through the UniqueCorals.com site, you will not get an answer until Monday morning. If you ask for a customization or substitution, we will try to accommodate you but please understand this may delay your ship date. Please make sure your shipping module is all set before Monday, as we will have a large number of orders to fulfill and we want everyone to get their coral in a timely manner. Please include your full name and order details in any PM or communications so we may properly identify who you are. You WILL collect UC reward points for all your purchases! Since your checkout experience will be at UniqueCorals, you can bank those points and use them toward any product on the site. Win and Win! Cali Kid Corals / R2R Live Sale!!! Saturday 3/30/19! Official Thread! Sale will begin at 10:00 AM PT. There will be some NEW RELEASES, One-of-a-Kind pieces, Giveaways, Raffle Prizes, $5, $10, $20 frags...and an overall GOOD TIME! Unique Corals Anniversary R2R Live Sale- April 28th 9am-9pm PST!!! We are happy to announce our 6 year anniversary Live sale on R2R. We had a great turnout at the beginning of the year. This one will have tons of excitement and Unique Corals for every tank. We will be posting some corals $5, $10, $15 each throughout the sale! Mosto coral will be deeply discounted. Sps and Lps Power Hours will be announced in the coming weeks and will have these types of corals heavily uploaded during those hours for morning and evening shoppers. You'll be amazed at some of the value you will find! Enjoy! You MUST create an account HERE on our website to place a order. All corals will be WYSIWYG on the Reef2Reef.com thread (yes, this thread right here). At that time, that coral will be available for purchase, you can click on the link in the post, which will lead you to the page to buy the coral. It is possible more than one person is able to purchase the same frag due to the large volume of customers. In this case the the first person will receive the frag purchased and the second customer will receive an item similar or receive a refund. Over 1000+ corals will be posted starting at 9am PST. You can expect a small batch every few minutes. The $5 doorbuster corals will be spaced throughout. With so many choice items, competition is fierce, be ready for some fast clicking! Please register with UniqueCorals.com first with your shipping information so you will have a fast checkout experience. Please make sure your shipping module is all set before Saturday morning, as we will have a large number of orders to fulfill and we want everyone to get their coral in a timely manner. 7 Awesome prizes to win! There are 2 ways to enter the drawings. Make a purchase during the sale, or make one post in this thread every hour during the sale hours (9am to 9pm PST). If you do both you get 2 entries. Each person can only win one prize. Drawing results will be posted the following Friday after the Sale. Those entering by commenting in the thread please try to engage with your fellow reefers and not just "check in". You will need to PM us after the sale if you believe you qualified so we can verify your posts. Drawing results will be posted the following Friday after the Sale. Lots more corals available guys! Here's a 30% coupon for the remaining live sale items! The coupon only applies if you input the code through check out. Please do not ask to adjust your previous order/s with the coupon. Thank you!